When I give presentations on fish selection and I mention Dottibacks, someone in the audience always blurts out, “devil fish!” For some dottibacks, yes. For the orchid dottiback, no. The orchid dottiback (Pseudochromis fridmani) is not only the most docile species in the genus, but is also one of the most striking. Its body is solid bright purple with a black streak though the eye and head. Under royal blue LEDs, the fish will glow as if radioactive. Known for being very personable, these fish take time to warm up to their surroundings. My experience in keeping them is that they will spend the first week to two weeks in a tank hiding in the aquascaping and only darting out of rocks to eat. Over time, they hide less and interact with you more. Clients who have these fish always fall in love with their orchid dottibacks as the fish greets them when they approach the tank and will sometimes follow the client around the tank. The orchid dottiback’s docile nature also lends themselves to be victims of bullying especially from more aggressive dottibacks. Therefore, if I am placing an orchid dottiback in a tank, I will make sure it is the only dottiback in the tank. Rounding out my reasons I love the orchid dottiback is that fact that captive bred specimens are readily available. My Orchid Dottibacks always come from ProAquatix and I’m proud to place captive bred fish in client tanks. Would you consider these fish on the fringe I have a neon dotty back that is a prime subject in my tank and has tons of personality well not to me but to my wife. That’s another story thier. Love this fish. I have one in a 27-gallon home office tank where it lives peaceably with two small Picasso clowns and a starry blenny. 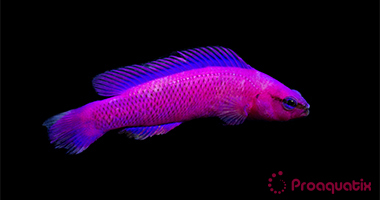 Another advantage is that orchid dottybacks can be kept in relatively small tanks. In time, though, it’s going to have to go to my 75, because it’s growing, but I’ve been reluctant to relocate it since I know it will take time to adapt to the larger tank. Can you have more than one per tank if you have a large (250+) tank? They’re very pretty, but small. My tank is covered with purple coralline algae so a purple fish just blends in I’m thinking. Is anyone keeping this fish with purple corraline and recommend it? We have a peaceful community tank. Mark recommended the orchid to us and we love her. This little fish is a scene stealer with her sweet temperament and beautiful saturated coloring . Great addition to our tank! Katrin, I have more than one in my 240: you just have to add them at the same time. My formed pairs pretty quickly and the remainder had to be taken out.